Q: My husband and I are having a new home built. At the last moment I decided to extend the width of the family room by 2 feet. I'm glad we did now that I see it framed. It's much more spacious. 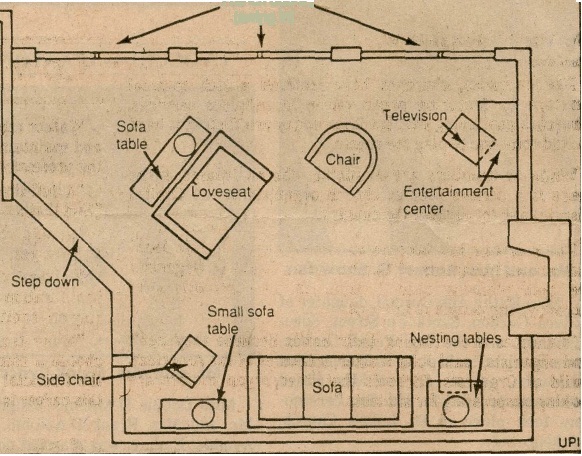 However, as I start thinking about furniture placement, I'm at a loss. Not only is the room an unusual shape, but one entire wall is French doors leading to a deck. To make matters even worse, the fireplace is now 2 feet off center. I already own a sofa and a loveseat, a small sofa table (36 inches wide), a larger sofa table (53 inches), an open armed chair and a small side chair. I want to use these in the room, but realize I might have to add a few pieces. 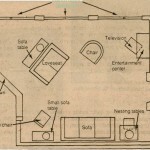 The only other requirement is a place for the television, which further complicates matters. If you could give me some suggestions, I would be very appreciative. A: The room is spacious and I like the unusual shape with the angled step down, but I can understand why you're having difficulty with the furniture placement. You wouldn't want to block the doors and the view outside by putting a sofa or any other large piece parallel to the windows. You also wouldn't warn to enter the room and walk right into the back of the sofa. I then put the small side chair in front of the sofa table, adjacent to the step down. You may opt for a coffee table, or choose to use the nesting tables when needed. In order not to block the doors or the entry into the room, I positioned the loveseat at an angle facing the fire place. The side of the loveseat paralÂ­lels the step down, and carries that line into the room, which I like. It also, to some extent, utilizes that rather awkÂ­ward space. There is plenty of space on either side of the loveseat to enable an easy flow of traffic in and out of the room. Perpendicular to the loveseat, on its right, I put the open-armed chair to form a conversational grouping. The nest of tables could also be used in front of these two pieces, which would be very convenient. I placed the television in a tall entertainment center to the left of the fireplace. A standard feature for many such wall units is a pull-out swivel shelf, which is crucial for this layout. The height of the entertainment center also helps to balance the offset fireplace in the room, a definite advantage. It may actually look as though you purposely designed the room with the fireplace 2 feet to the right of the center of that wall. It's a definite coup in design if we can take what would commonly be thought of a: a problem area, and make it appear a; though it was done intentionally.